At about the time you were coming home from church last Sunday and Earl was brushing by the Virgin Islands, the Navy was making a multi-million dollar decision. Do we sortie the fleet out of Norfolk or keep the ships in port? Such a decision comes with high stakes and dollar amounts. The order to get the 60 or so ships out of port and underway costs millions of dollars in fuel consumption and overhead. But the fleet, guided by the talented ship routers at the Navy’s oceanography center in Norfolk, would then have the room to avoid the storm’s effects and return unscathed after it passed by. Staying could be even more costly. If Earl were to deviate from its course and move inland – the worst case scenario would be an unanticipated direct strike in the Hampton Roads area – ships could be battered at the pier by Category 2 winds. The damage could cost many millions of dollars and potentially affect fleet readiness. To complicate the picture, the decision must be made days in advance when the hurricane’s path is less certain. Waiting until the storm track is more precisely known is often not an option. A late sortie could put the fleet right into the teeth of the storm at sea (ask ADM Halsey what that is like). If the decision is to stay, at some point that decision becomes irreversible – for the same reason. Many people are involved in the decision, but the final say falls on the shoulders of one man – Commander SECOND Fleet (currently Vice Adm. Daniel Holloway). In Earl’s case, VADM Holloway made the decision to stay. As I write this, it appears to be an excellent decision with sustained winds expected to be below tropical storm force in the Hampton Roads area as the hurricane passes by. But you can bet he didn’t get a lot of sleep Thursday night. This is just one of many huge decisions made by Navy leaders every day, and one that is repeated every time a hurricane threatens a fleet concentration area. 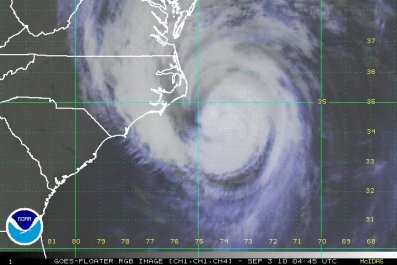 If I am not mistaken, the last time the fleet was sortied out of Norfolk was in 2003 with Hurricane Isabel. After circumnavigating the storm, the fleet arrived back in Norfolk with no damage and without fanfare. But the non-news was a tribute to the tough decision to get underway (ADM Roughead), and to the brilliant job of ship routing by the Optimum Track Ship Routing team who guided the ships completely around the storm safely. In my book, it was a textbook example of professionalism and expertise in a little-known and under-appreciated field where millions of dollars and thousands of lives are at stake every time a hurricane approaches.